But I was enjoying this specific project quite a lot! It did take a lot of time, and effort, sure, but on top of that the quantity was really notable! 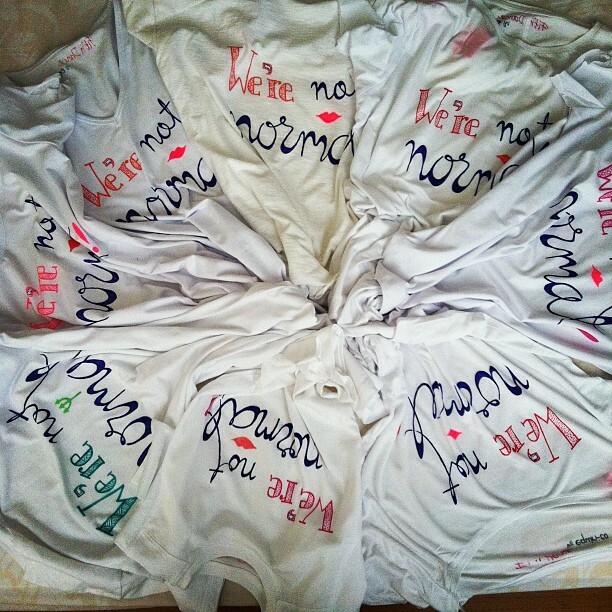 So I was more than happy to do it, it was also hilarious that they wanted “We’re not Normal!” written on top of each shirt, with lip figures for girls and satan’s prong for boys. To make things more ‘couture’, I suggested we make each lip a different shade of red/rose and the prongs vivid green. They wanted purple letters on top of white t-shirts. Isin asli, bu proje gercekten yapmaktan keyif aldigim bir calismaydi. Epey zaman ve emek aldi, almasina ama bunun tek sebebi sayinin cok fazla olmasiydi! 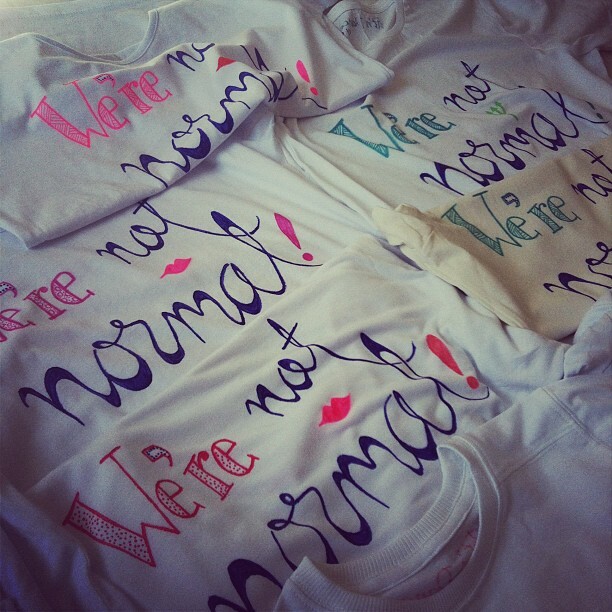 Beyaz tisortler uzerine mor renkte “We’re not normal!” (normal degiliz) yazmami istediler. Son derece eglenceli bu fikir ile seve seve yapacagimi soyledim. Kizlara dudak sekli, erkeklere ise seytan asasi istediklerinde, olayi daha da kisisellestirmek icin dudaklarin renklerini farkli yapalim ve seytan asasi da fosforlu yesil olsun, dedim. 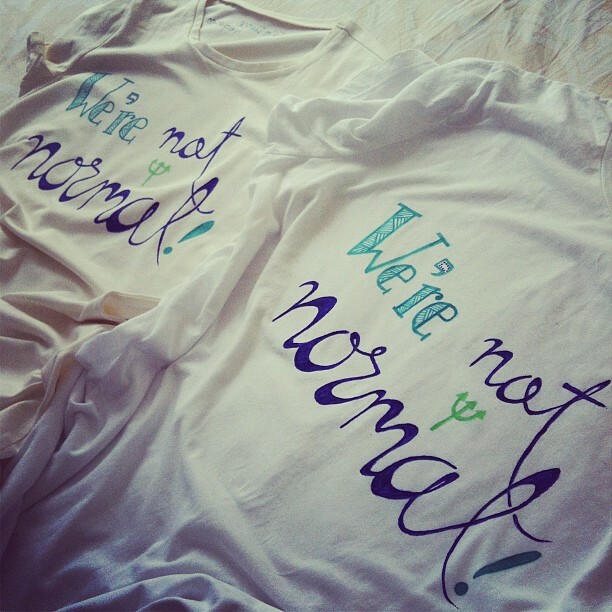 “we’re not normal!” typographic design in purple and green on white cotton t-shirt. design hand lettering by equin-co™. When I got the “Aaaaweesomeeee” feedback I wanted from the client, I went for it for the girls, but I used different shades of pinks and purples just to keep me instrested to paint the same design over and over again. “Hariiiiikaaaa olmuuus” cevabini aldiktan sonra, kizlarinkini yapmaya basladim. Ayni deseni cok sayida tisorte tek tek yaparken hem sikilmayayim, hem de ilginclik olsun diye farkli tonlardaki pembe ve morlari yazilarda da kullandim. 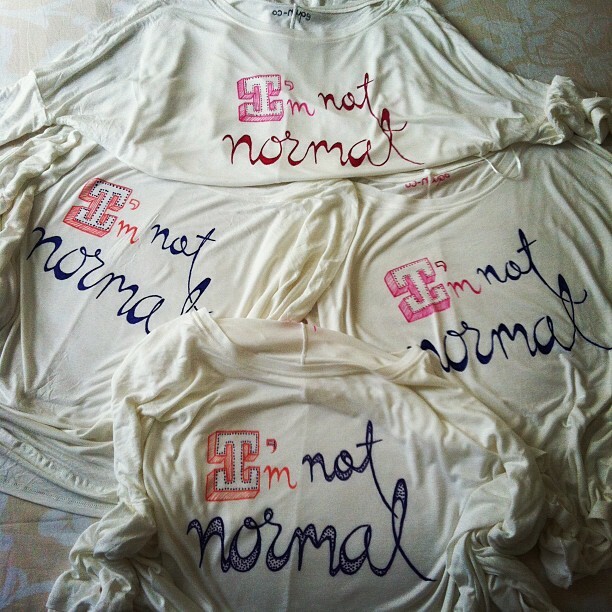 I made a sum of 14 t-shirts, I even threw in some “I’m not normal!”s which was the initial order, but then the class changed their mind. Since the typography (and the philosophy!) 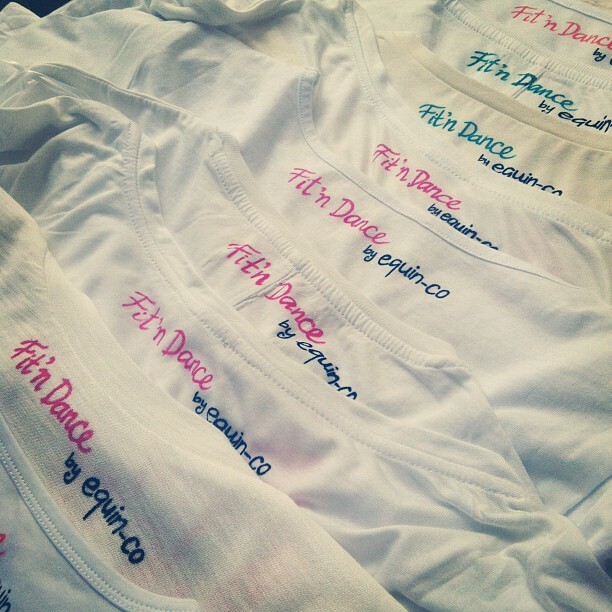 on the t-shirts were so good, the client wanted them anyway, and who was I to refuse? Toplam 14 tane tisort yaptim. Hatta ilk basta istedikleri “I’m not normal” calismalari (ve arkasindaki felsefe :p) o kadar tatli oldu ki, onlari da almaya karar verdiler. Kimim de boyle bir teklifi reddediyorum, degil mi? 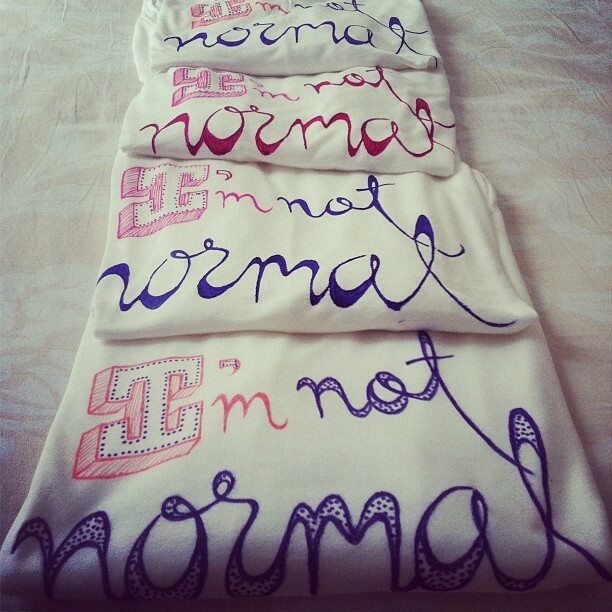 “I’m not normal!” design and hand lettering by equin-co™ on white cotton long-sleeved t-shirts. 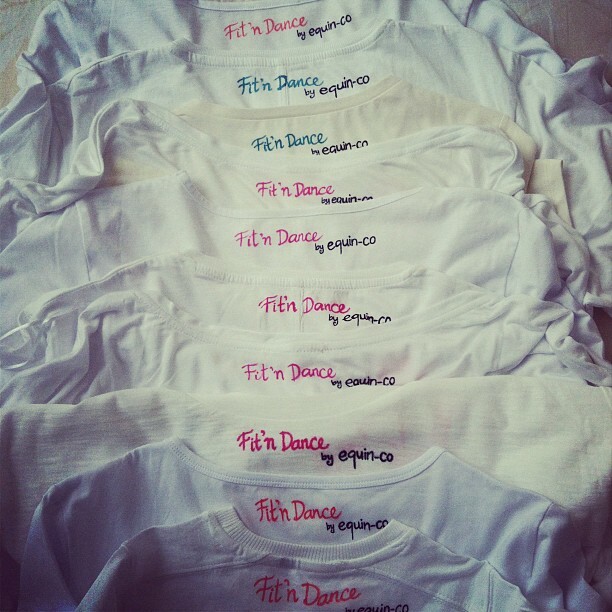 And here are the labels: Fit’n Dance by equin-co! 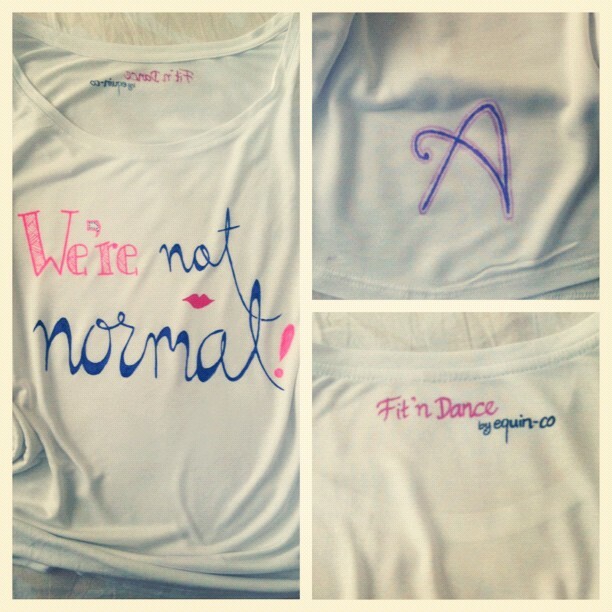 For those of them who wanted initials at the back, I made initials! Isteyenler icin isimlerinin bas harftlerini sirtlarina yazdim. “we’re not normal!” design and hand lettering by equin-co. Initial A at the back. How do you like them? Would you wear them?